One wedding aspect that often gets little attention during the planning stage is the table setting. The duty is sometimes left to the stylist in order to move on to other bigger projects and to-dos like the gown, the cake, and the venue. But as someone who’s getting married, getting involved and working on the table scene is a great way to get creative and add your personal touch to the overall look of your big day. Although considered a minute part of the whole affair, a wonderful tablescape can make a big difference. It is the finer details like this that actually catches the guests’ attention, something that they remember at the end of the celebration. 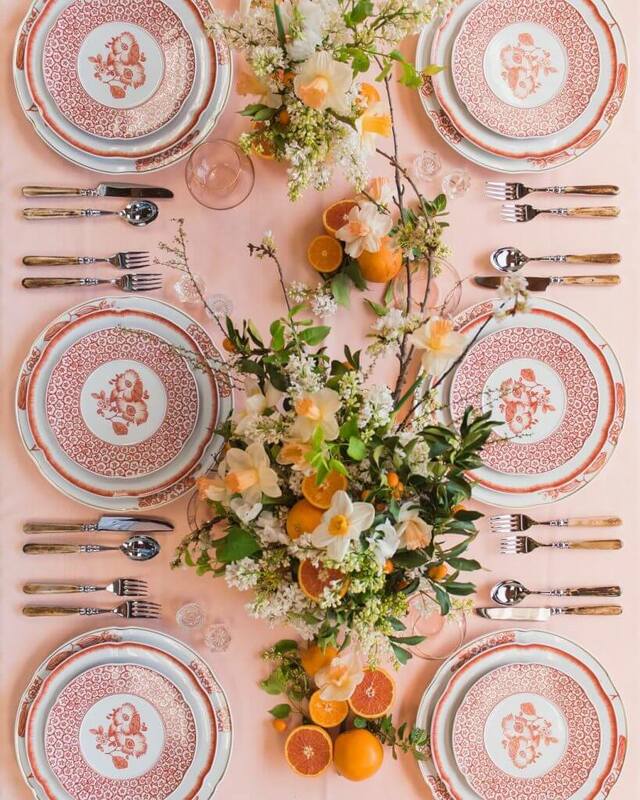 There are a number of ways you can elevate your table setting – beautiful centerpieces, quirky accents, artistic menus, and sleek tableware – all you need is the right vision. In this article, we’ve compiled stunning tablescapes of different styles and tastes – from classic to modern — where you can draw inspiration from. These timeless tablescapes are luxurious, elegant, and simply unforgettable. 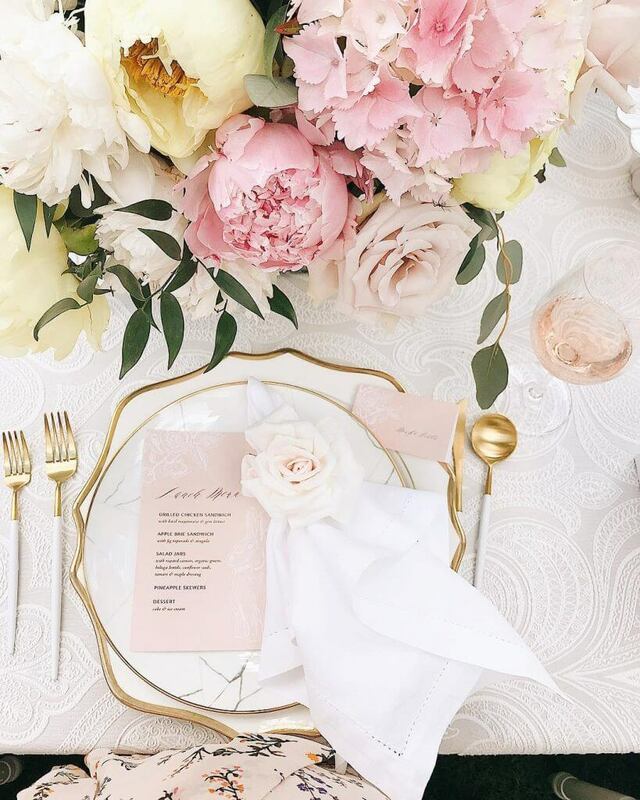 Neutral linens, posh dishware, and fabulous florals complete the arrangement. A table setting like this one will definitely never go out of style. 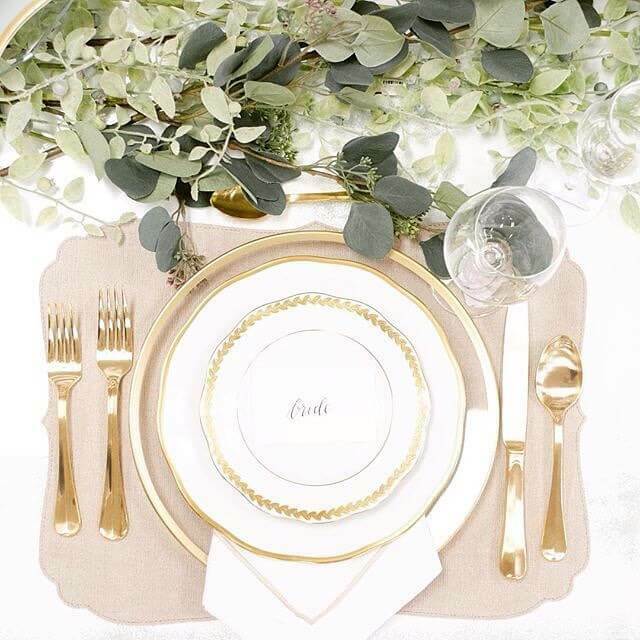 Exquisite tableware of gold and elegantly-placed arrangement of greens perfectly match to complete the look. Add a simple name card and you’re all set. Nothing says personal touch than this style. 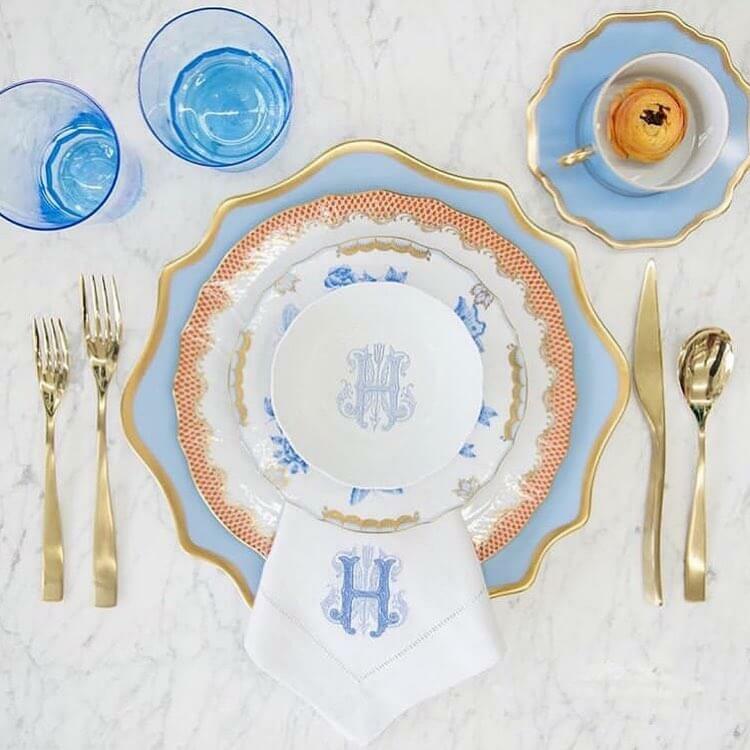 Monogrammed tableware and napkin that represent you and your partner. Have fun and use a couple icon – anything goes. This one in light blue and rust create a cohesive look fit for a king and queen. You can even keep these wares for personal use at your new home! Let love overflow on your big day through your table setting! Delicate florals or white, pink, and peach; dainty accents of pearls and jewels; candles; sweets, chocolates, and heart-shaped napkins – now that’s utterly romantic! Already have eyes on your florals? Then it’s now easier to curate your tablescape! Just find complementing accents like this dusty pink and blue arrangement. The pop of red from the roses and the brown woven charger give a warm finish and the printed linen gives an elegant touch to the overall look. 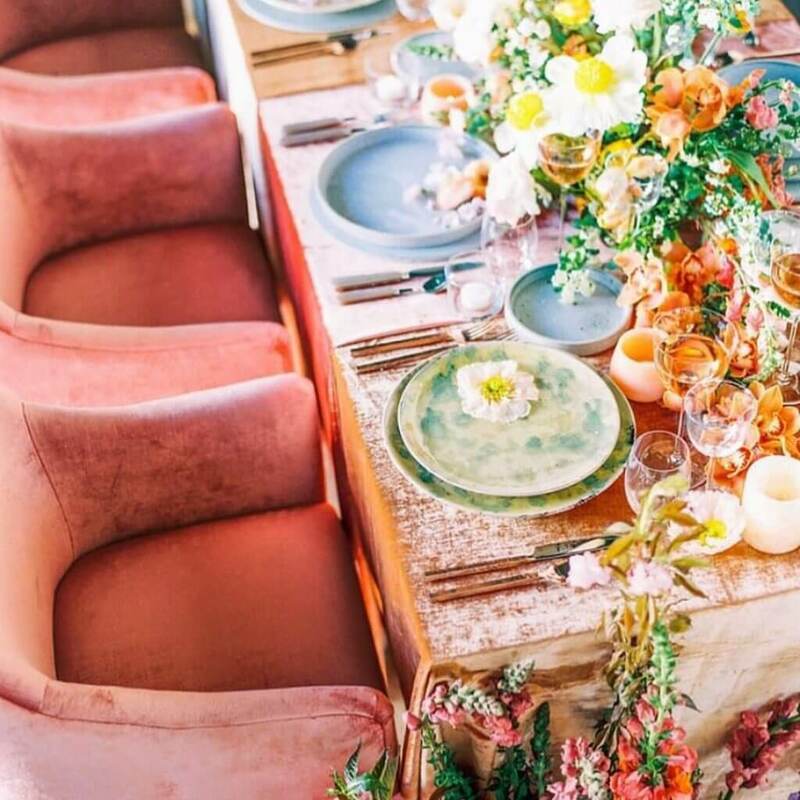 Add a dreamy woodland air to your dinner using flowers and flatware that balance each other out like this gold, green, and pink combo. 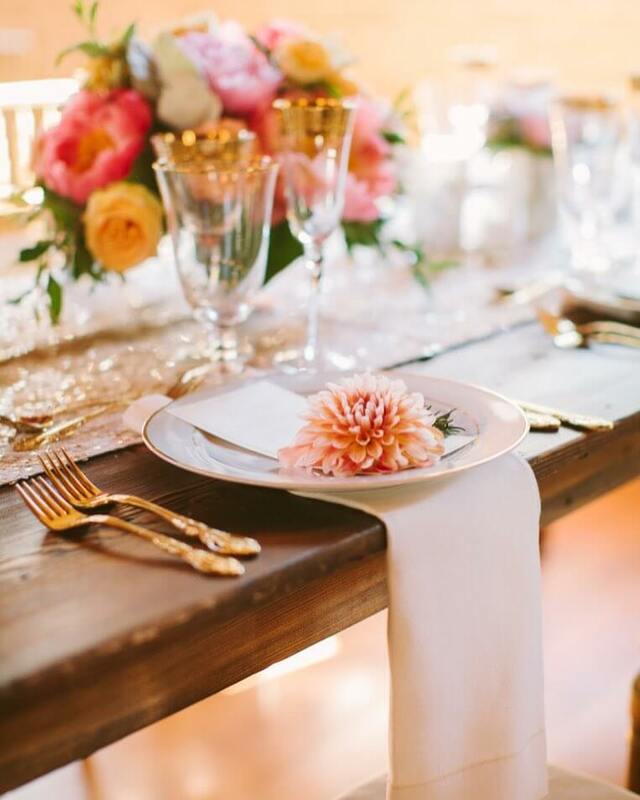 The blush glasses match the florals and the intricately beautiful charger and golden cutlery go well with the wooden table. Create an impact on your big day by making sure that your table setting is well thought out. The secret is creating a cohesive and complementing overall look by using colors that go well together, applicable to your flatware and accents like menu cards and name cards. 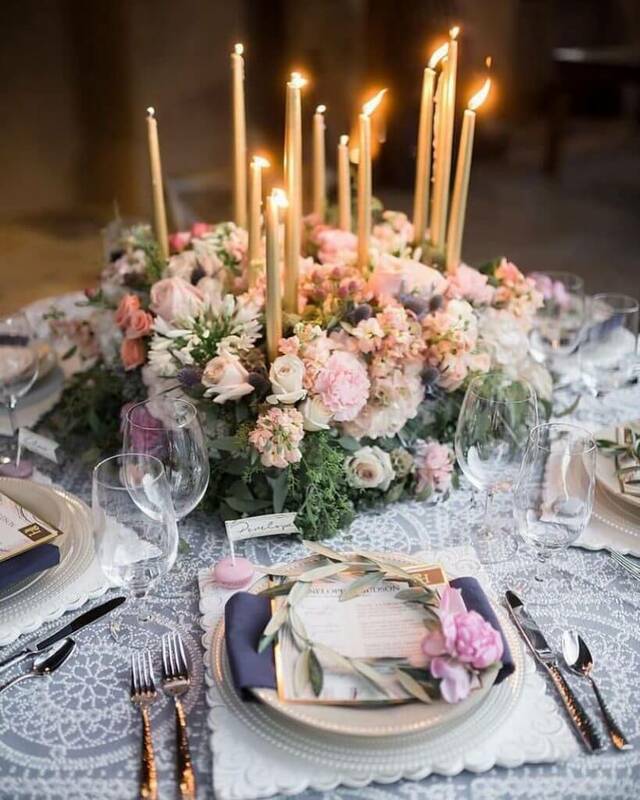 Candles cast a glamorous glow to a table setting and it’s a great addition to an already gorgeous table design. For a non-traditional touch use unique square chargers and a hint of color to a plain plate using wreaths of leavers and flower. For a sweet finish, use French macarons as name card holders. If you’re having a laid-back affair, going for chic and casual tablescape is the best approach. The best thing about casual settings is that you have more freedom to get creative and add personal touches that are beyond the usual. 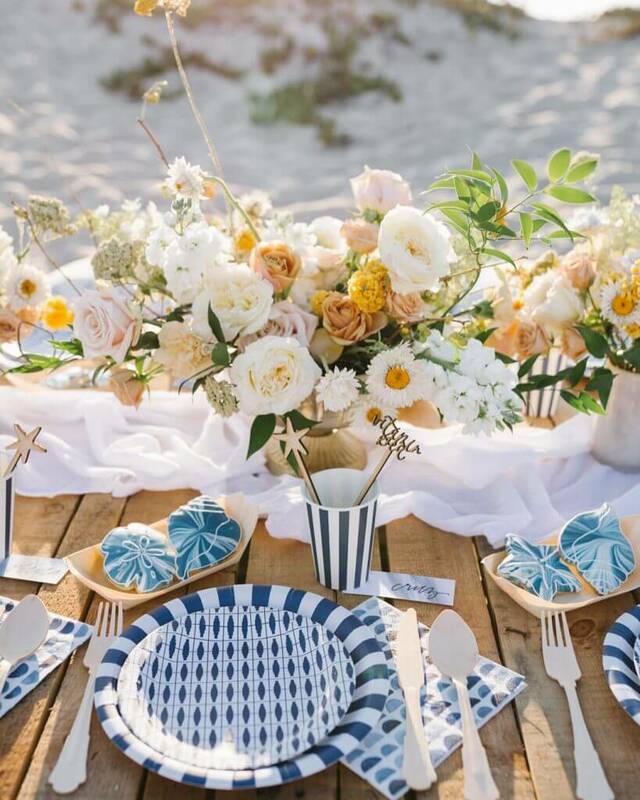 A sweet seaside party calls for a nautical and nice table setting! 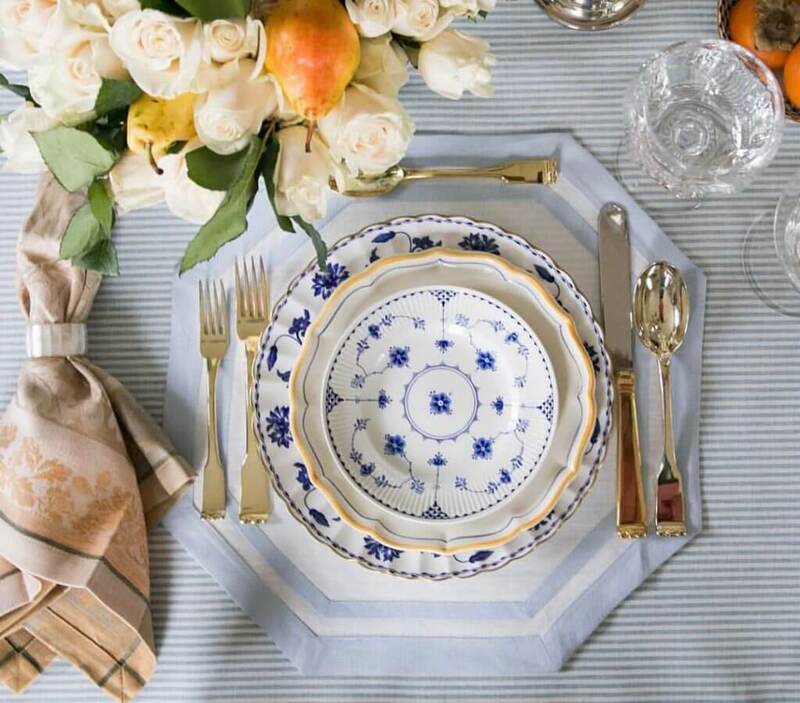 Go for bold prints of blue and white for your dinner ware, wooden table and utensils, and white and yellow florals. A clean and simple linen is enough to make the arrangement simply beautiful. To complete the theme, use ocean-inspired sweets and cookies for your guests to nibble on. Stand out from the rest with this anything goes style. Go with fun and mismatched tableware designs, exotic florals, and cute accents like colorful straws and printed cookies, and funny menu cards. Not just for weddings, this style is perfect for outdoor parties and kiddie celebrations. Ahoy, captain! 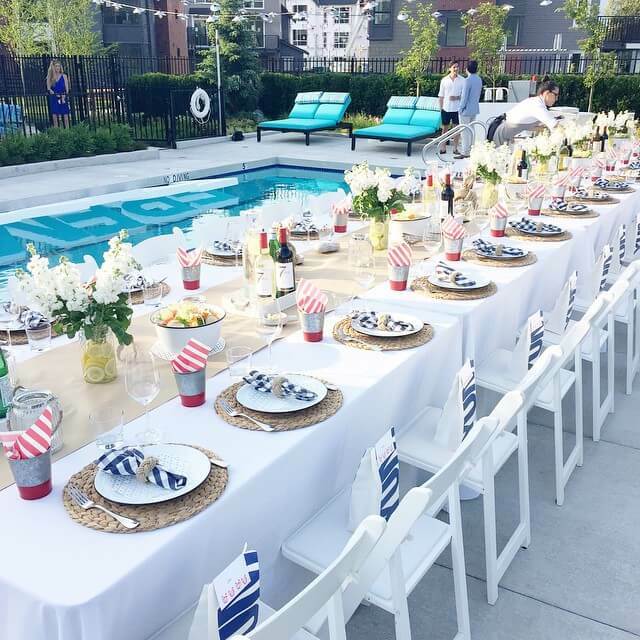 Go on-theme with your poolside party by using striped and woven accents, white wooden chairs, and simple white florals. Have refreshing drinks available so your guests can quench their thirst, especially if it’s an outdoor event. Got some favors to give? Put them on top of their seats so they can enjoy their goodies once they get settled! Your guests will surely go bananas with these fun prints! 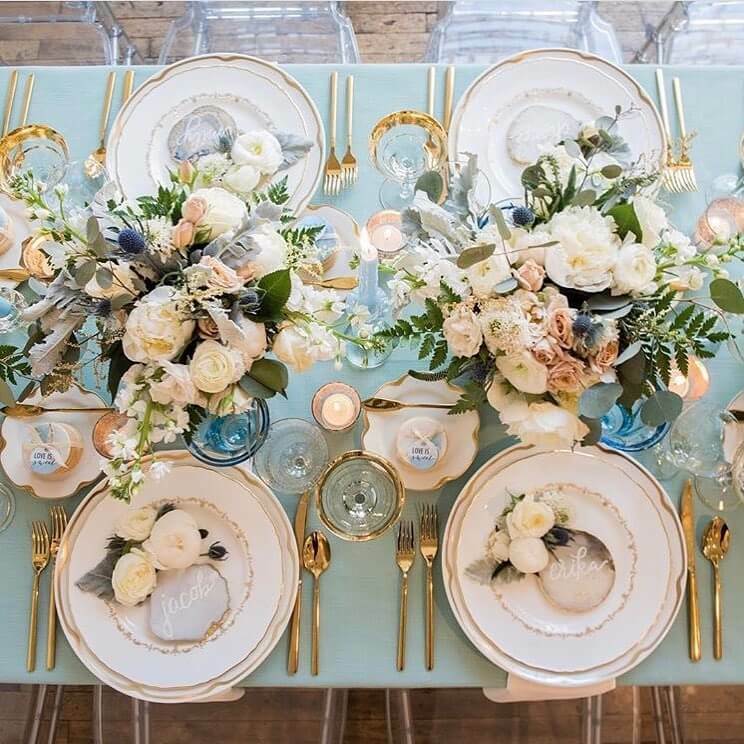 No need for overwhelming accents, just a beautifully printed dinnerware, gold flatware, and complementing stemware are enough to make a setting as simple as this unforgettable. Great for special occasions or even for that fun and relaxing brunch with friends and family. Who says you can’t have fun with plaid? Whether it’s a kid’s celebration or you’re having a pizza party at home, a setting like this will surely make the whole affair extra fun and funky! This hot from the oven look with surely add extra pizzazz to the whole affair. 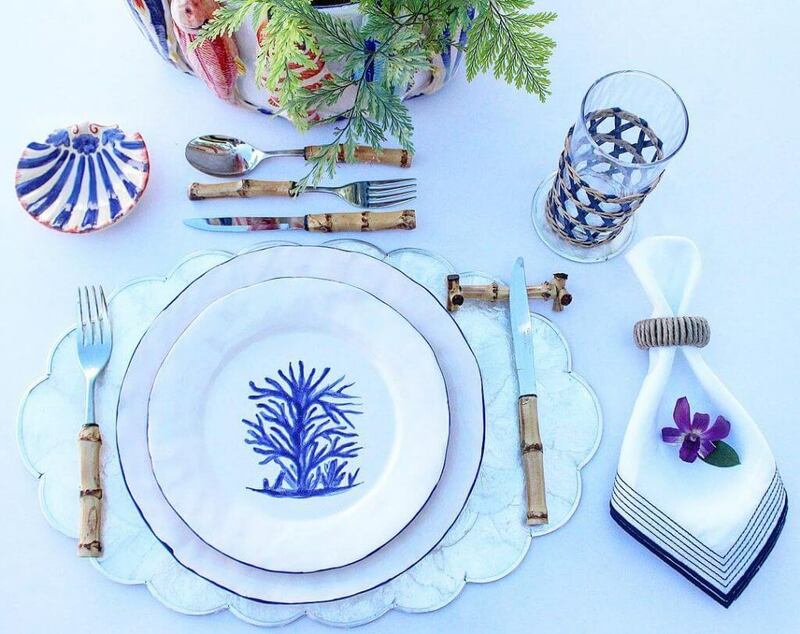 Your guests will surely feel the ocean magic with this cool tablescape. The classic blue and white combination gets elevated by the coral-painted plate, clam-shaped saucer, and cutlery with bamboo handles. Finishing the look are ferns that look like sea grass. 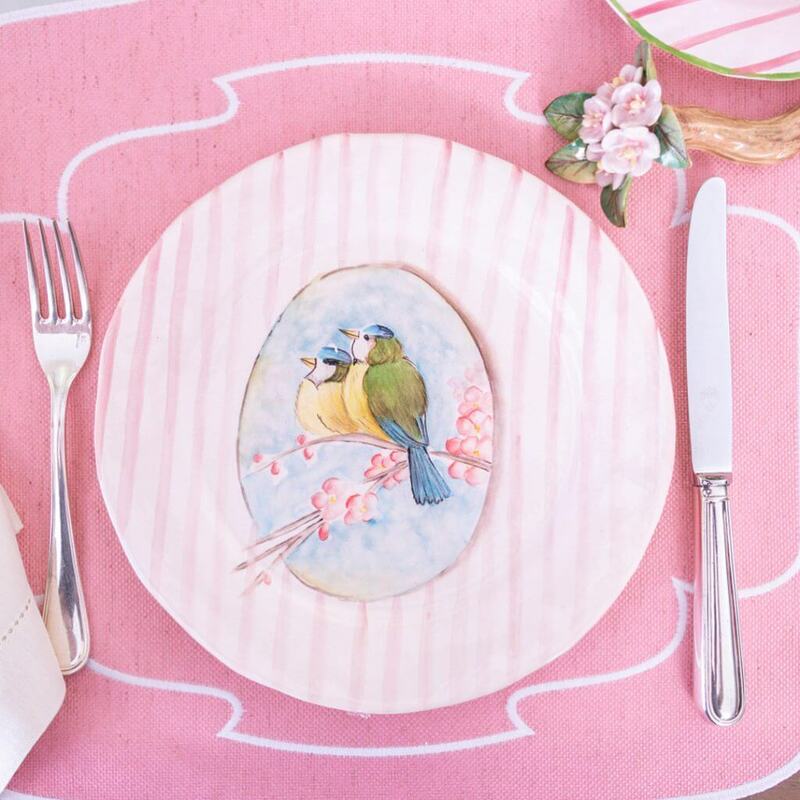 Go for something artsy and use painted plates for your table setting. What’s awesome about this is you get to pick the artwork based on your theme. This one is perfect for baby showers, christening, and even tea parties with your girl friends. 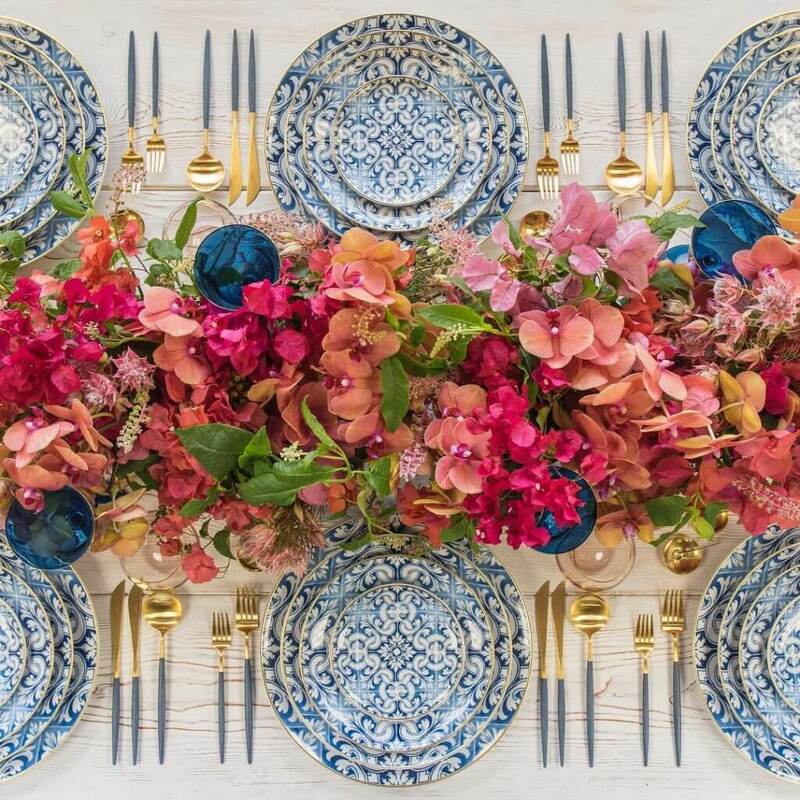 There’s always something new to try when it comes to tablescapes and you should not be afraid to infuse some of these fresh vision to your arrangement. Fun geometric shapes, bold colors, quirky prints, and pleasing patterns – you need all of these to update and elevate a traditional setting from simple to stunning. Chic and stylish, this modern table setting gives a whole new meaning to personalized. 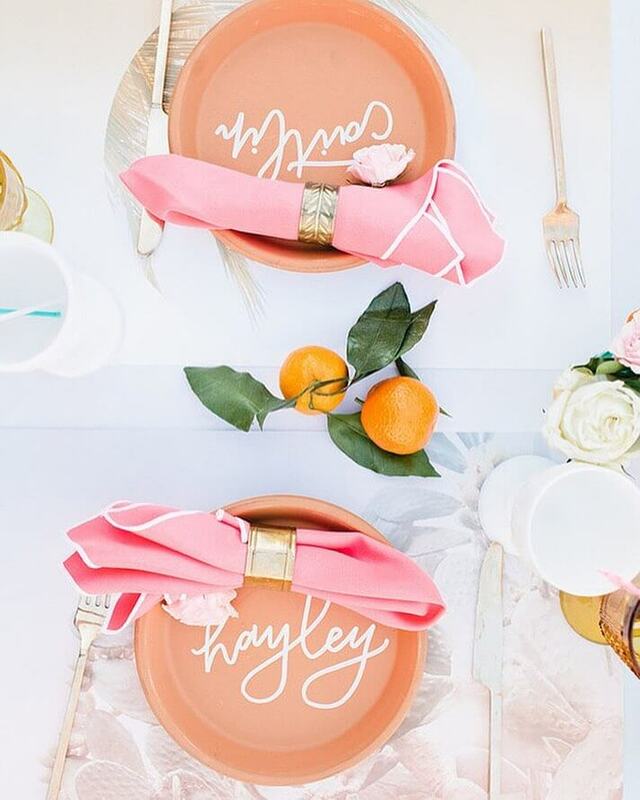 Instead of name cards, write in the name of the guest on the plate itself using clean calligraphy fonts. Use fruits as centerpiece and bold napkins for a punch of color. All set for a fun party! Blooms are usually the star of the table but not with this tablescape. The use of big, bold, and blue vases add personality to the whole creation. 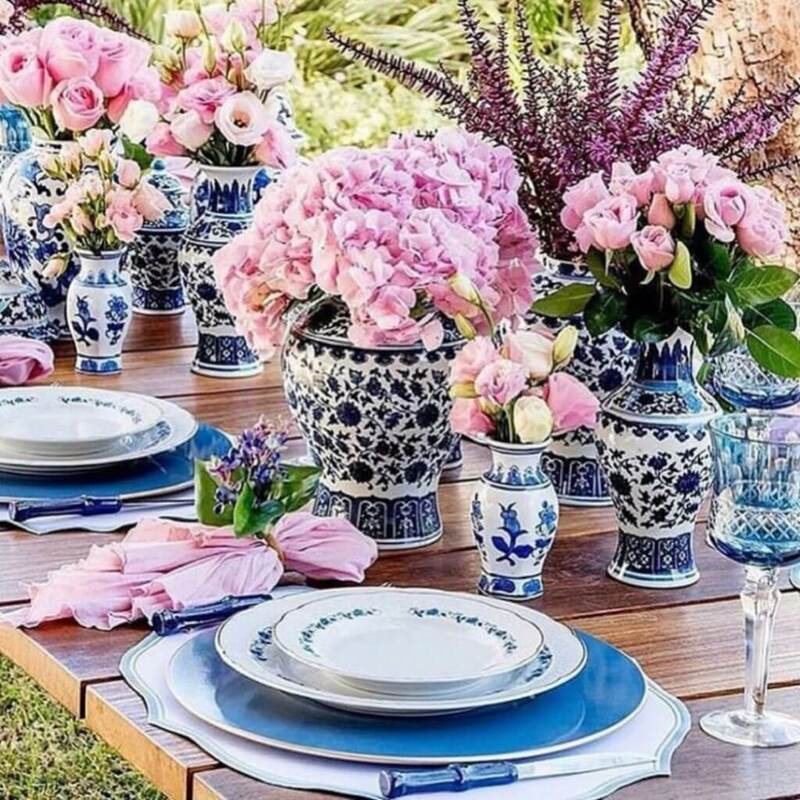 The dinnerware, stemware, and linens go so well together; plus, the complementing colors of the vases and flowers as perfection. Nothing’s more beautiful than this gold-themed setting. 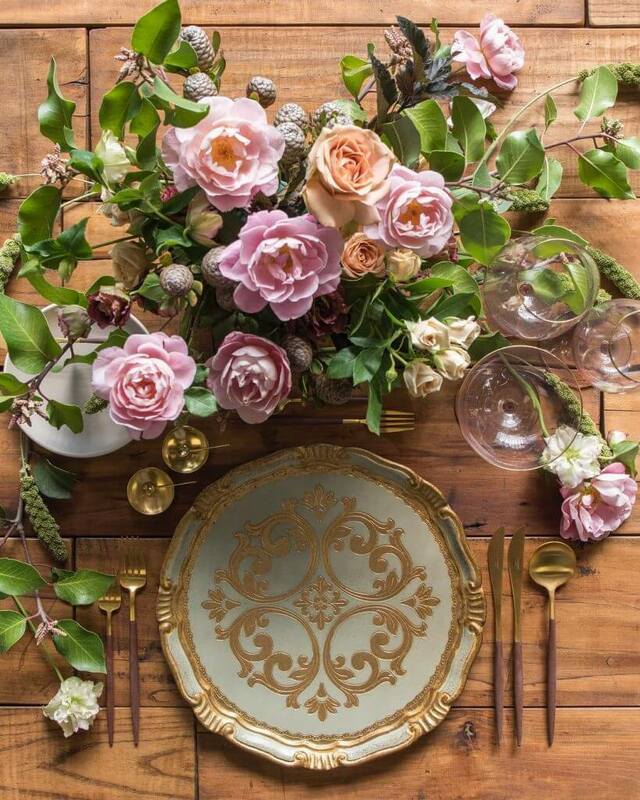 The intricate metal wreath charger, matching cutlery, gold-rimmed stemware, and complementing florals of peonies and roses are just gorgeous. 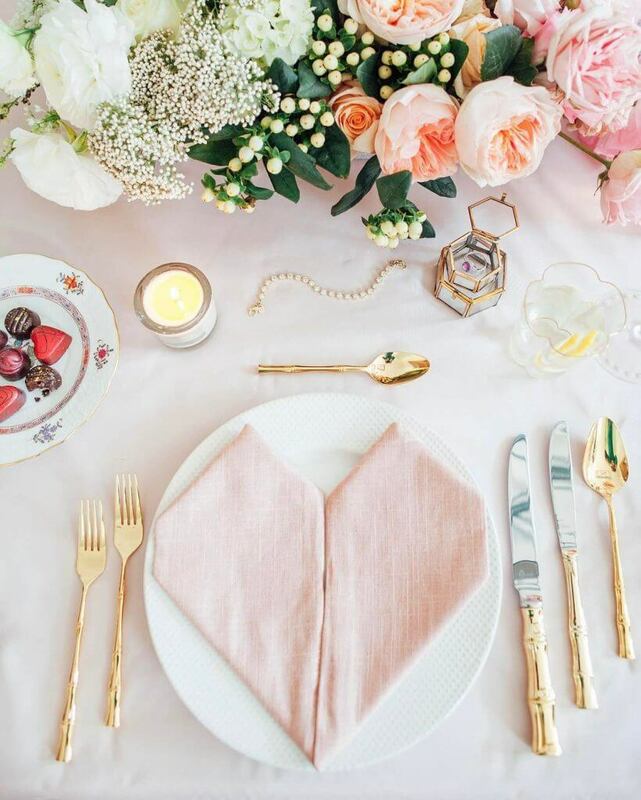 Add in the gold-colored ribbons and menu card and you have the perfect tablescape. 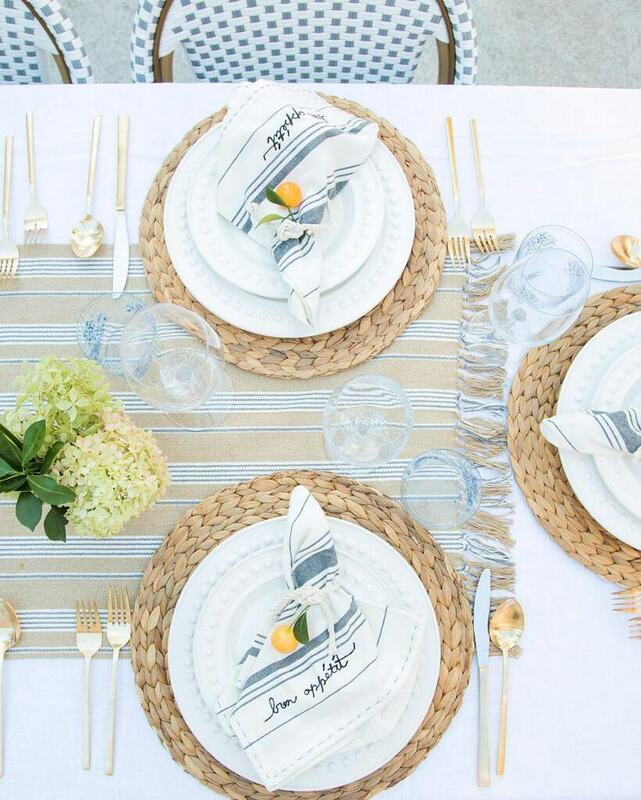 Get transported to the gorgeous Greece with this amazing tablescape. The white reminds us of ancient whitewashed villages and architecture, the blue of the Aegean, and the gold the glorious Greek sunset. Completing the look are vibrant florals of wildflowers, orchids, and bougainvillea. Stunning! 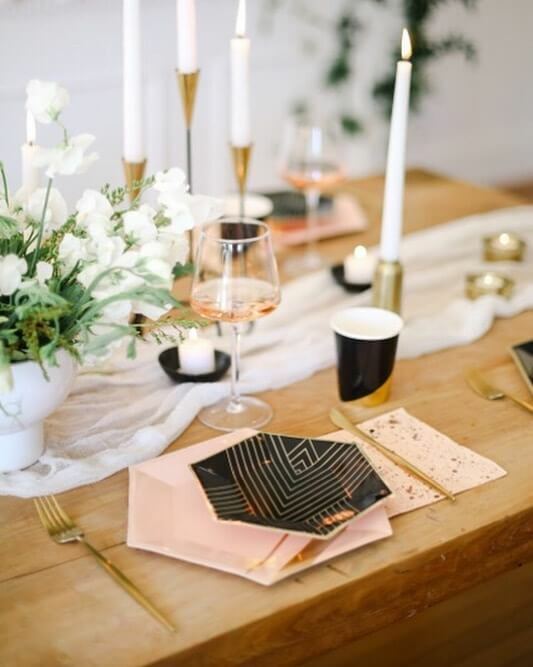 Copper accents are all the rage these days and one of the best way to incorporate them into your table setting is by using them for stemware. 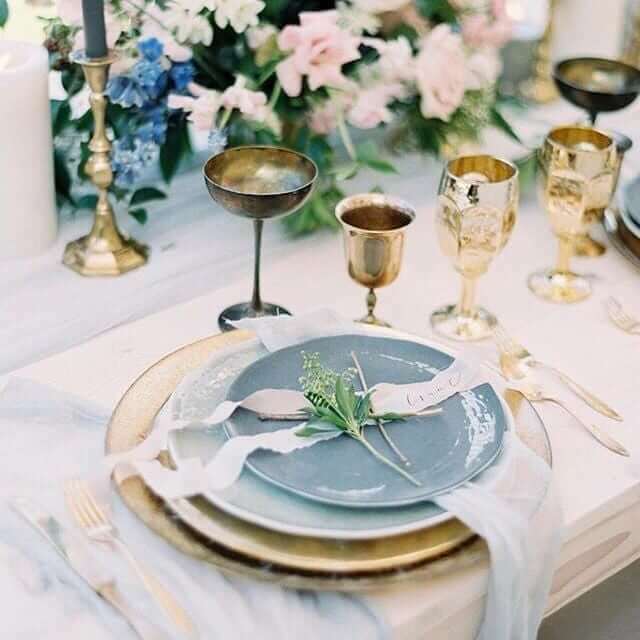 Copper goblets, wine glass, and chargers give a romantic old-world air to the arrangement, add the complementing blues of the linen and plates and you got a winning table setting. Exude the beauty of the Mediterranean sunset with this stunning setting. 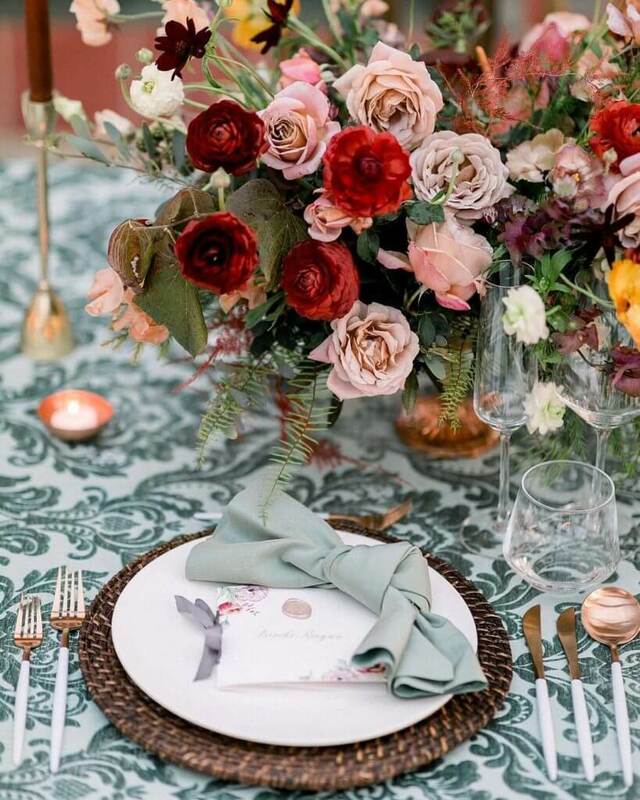 Warm tones of yellows and orange wildflowers, candles, delicate glass stemware, and pretty colorful plates. The velvet linen completes the exotic yet romantic vision. Go for the unconventional and opt for chic and stylish shapes for your dinnerware like this hexagonal printed plates. Pair with golden utensils, a simple and soft linen, clean and light florals, and a single glass stemware. Complete the look with illumination from white candles in golden holders. Fall in love with glass and lush with this setting of crystals, greens, and copper combo. 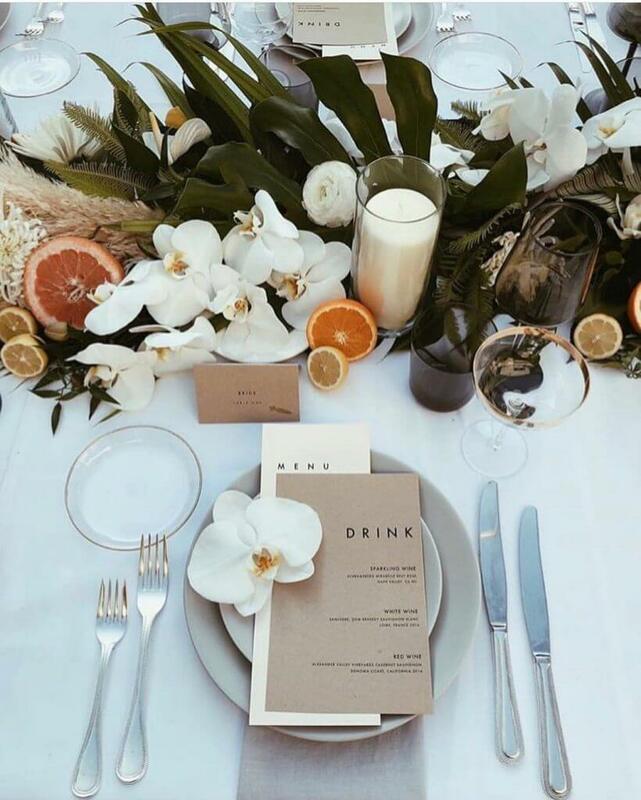 Earth tones colors and clear grass dinner and stemware make a refreshing and cohesive look. 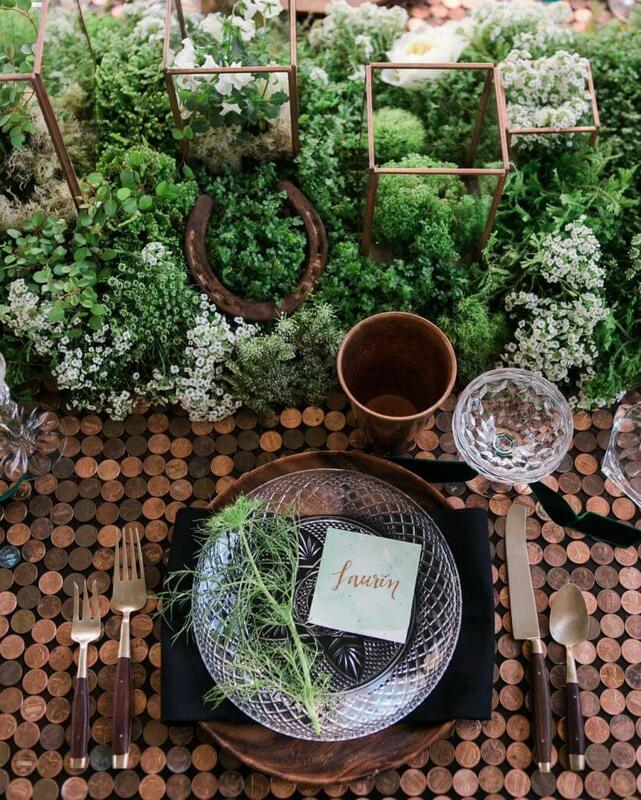 The unique use of coins as mats instead of the usual linen and the sleek mini terrariums for centerpieces make the tablescape an event must-have. Be it a formal or casual affair, a setting inspired by romance is always a hit. Delicate details, soft colors, and intricate inspirations are surefire tricks to come up with something your guests will fall in love with. Some of your must-haves? Candles, crystals, and lots of beautiful florals. 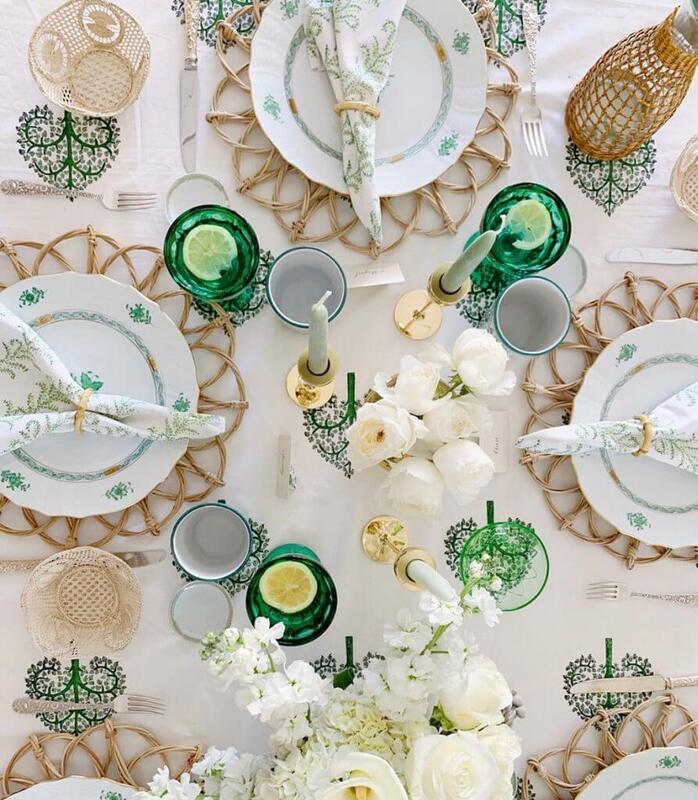 Wow your guests with a white and green garden-inspired setting – green stemware, leaf-printed plates and napkins, and woven chargers and bread baskets. Adorn with candles and florals and you’re all set. Just the perfect style when you’re hosting an outdoor wedding, a brunch, or tea party at home. This arrangement is so beautiful it looks like it’s straight out of a fairytale. 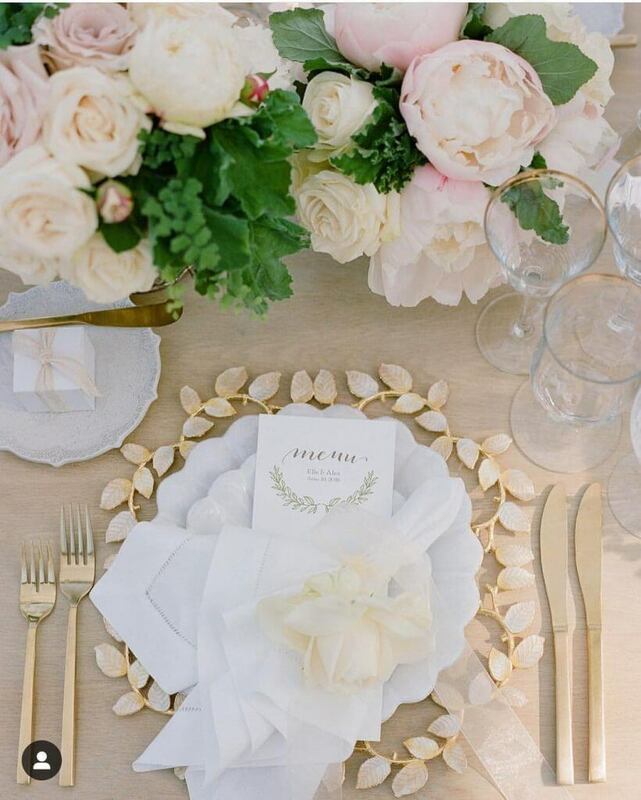 Gold-rimmed glasses and plates, soft linen, and golden cutlery — dainty and dreamy with a flower on top! Soft and complementing colors, textured linen and a stunning centerpiece make this arrangement cut above the rest. The gold-rimmed marble plate and partner charger goes well with the overall look, finished by a floral napkin ring. Of course you can mix prints! Striped linen and dinnerware of blues and yellows surprisingly go well together with the silver cutlery. The octagon place mat puts a quirky personality and the brown napkin add in an earthy tone to the overall design. Your table will surely shine and shimmer like this setting highlighted by crystal wares and candles. 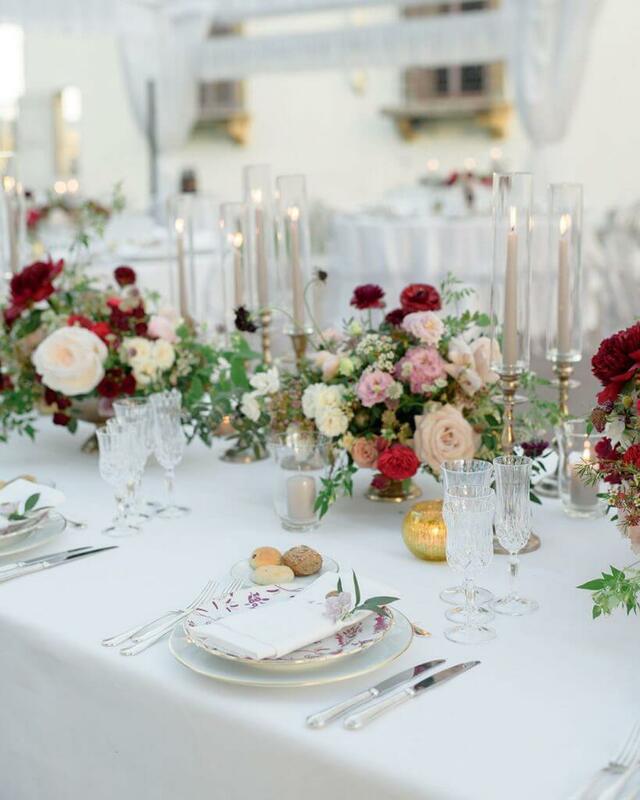 The crisp white linen helps make the printed plates stand out as well as the magenta and burgundy florals. The candles in glass tubes finishes the vision with romantic glow. It’s a citrus and coral love affair with this one! 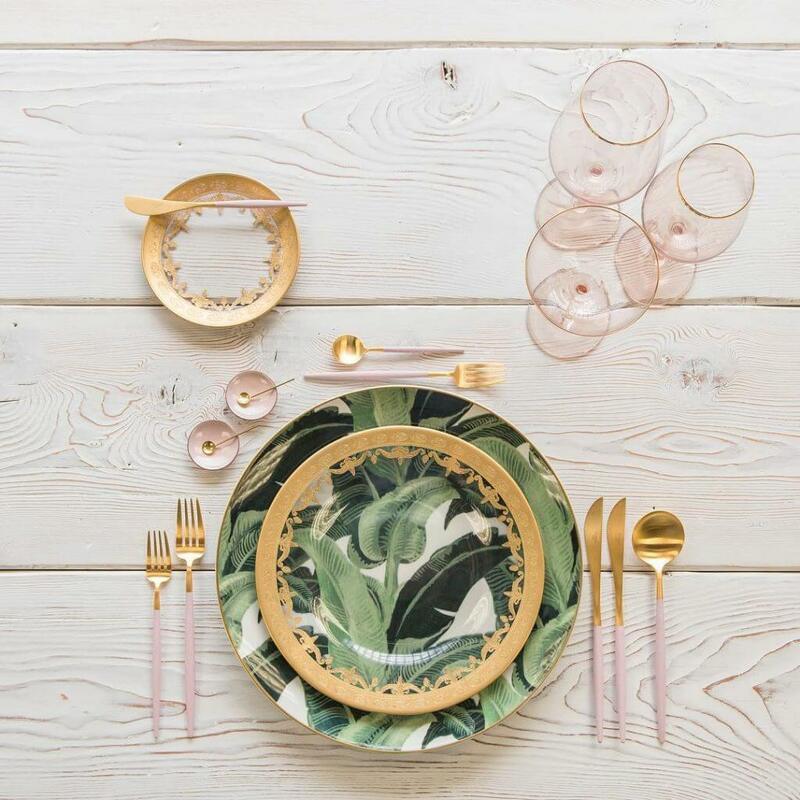 The perfect combination of color and styling has created this beautiful setting of fine porcelain hand-painted to perfection plus bone flatware and blush gold-rimmed glasses. 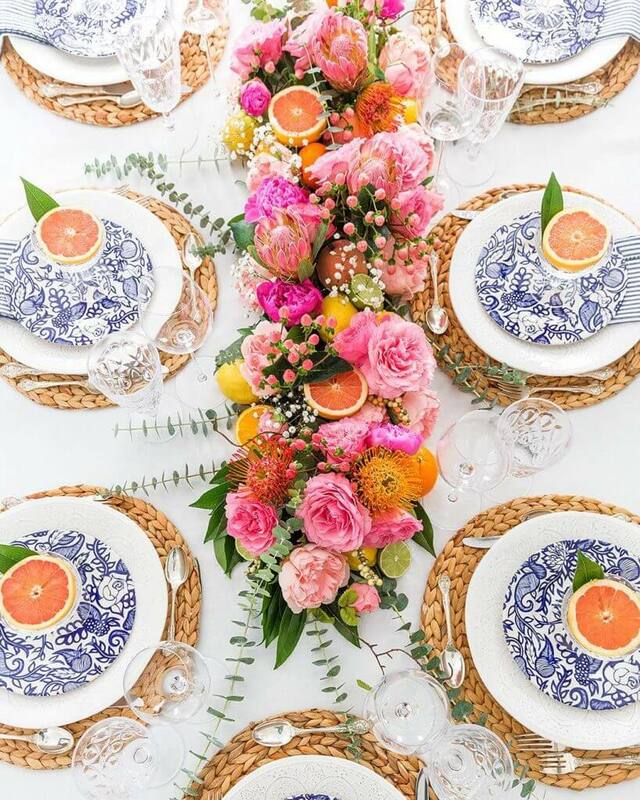 The centerpiece adds a fruity punch with a burst of oranges and greens finished by a complementing linen. Make your guests feel some jungle fever with this majestic table setting. 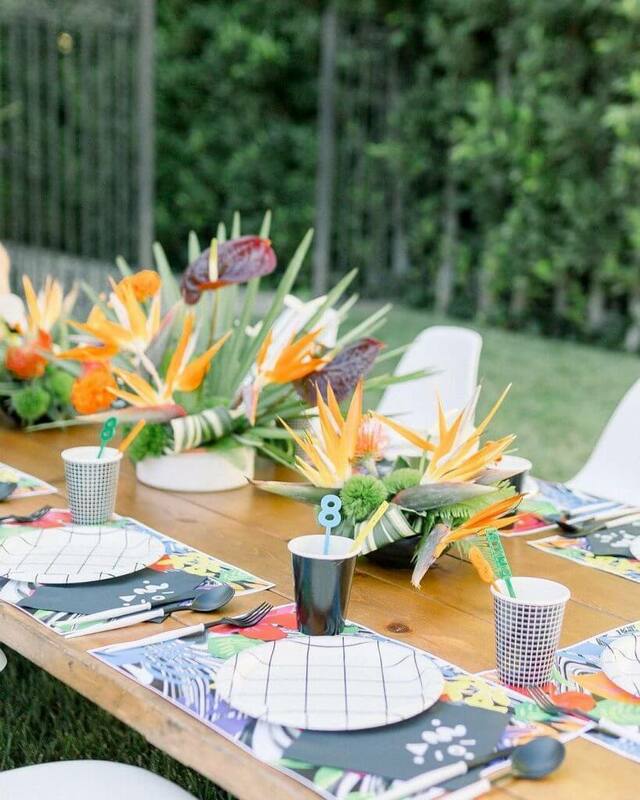 Exotic flowers, greens, and a punch of color from fruits give a fresh and modern take to a tropical-inspired affair. Candles, crystals, and simple silver cutlery perfect the whole story. Your party will surely be a pot of gold with this captivating and imaginative tablescape. 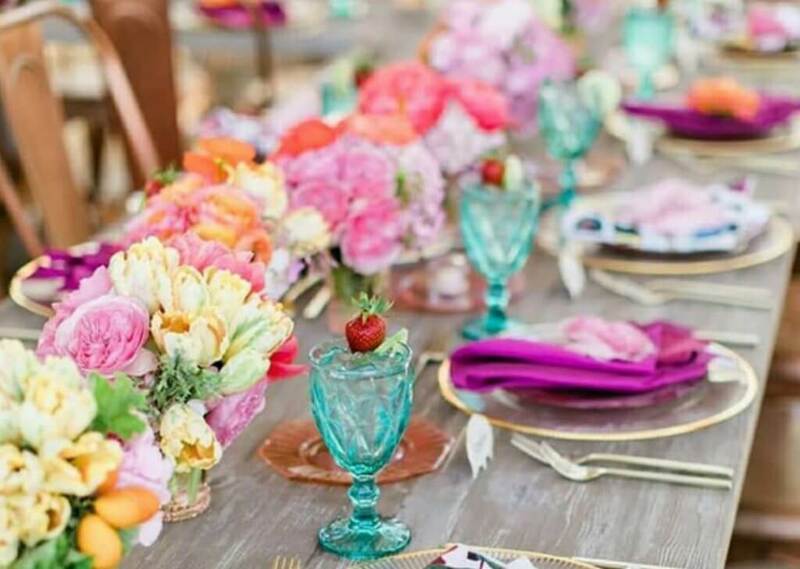 Purple linens, turquoise goblets, floral fiesta of hues and colors, finished with glass and gold ware. Now that’s making a statement! This fabulous rustic table setting is giving us major woodland wonderland vibes! Burst of blooms and simple tableware when put together create a magical appeal. Wreaths of flowers and greens make fresh and perfect plate accents with glass stemware adding a touch of elegance. Just the ideal feature for an entertaining and enjoyable party – for kids and adults like! 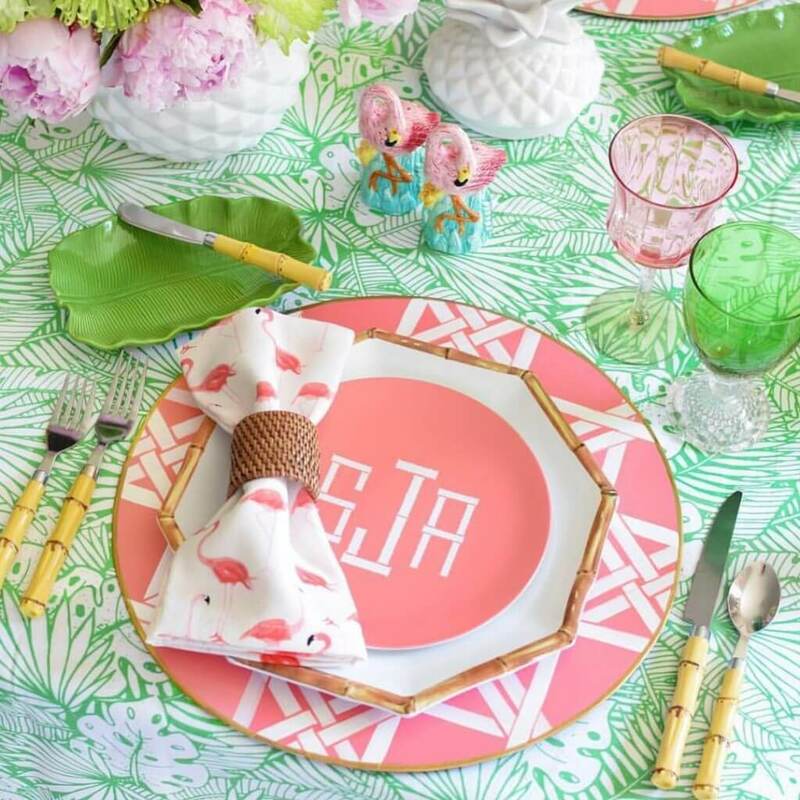 This flamingo—themed table setting gives off major summer vibes that remind you of holidays at the beach and good time under the sun. 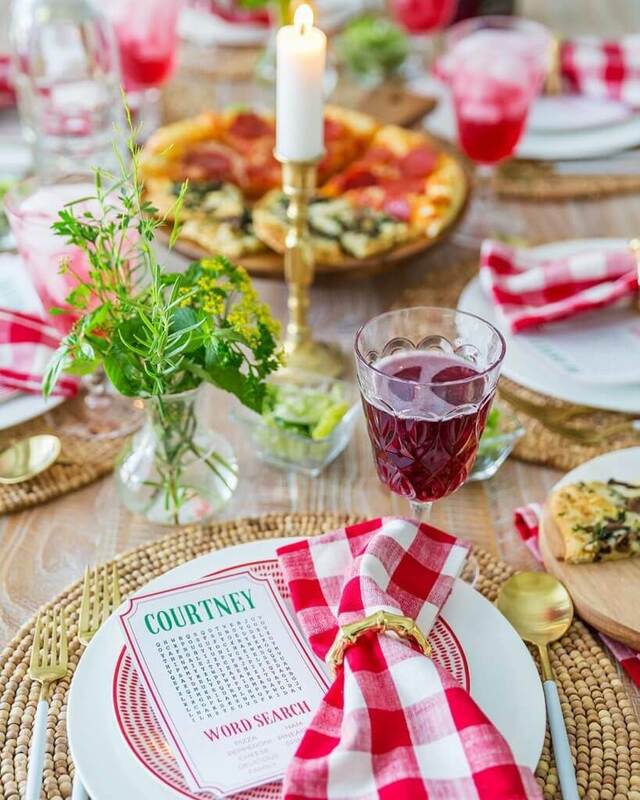 Monogrammed plates, bamboo cutlery, multi-colored stemware, cute ceramic accents, and funky printed linen – now that’s a celebration we would love to attend! Create a nice surprise for your guests by doing things the non-traditional way. Serve sliced grapefruits in goblets and partner printed tableware with plain stemware to create a nice and beautiful contrast. Don’t forget a woven charger and some striking and exotic florals for some summery punch. If you want to get the best of both worlds, mix casual patterns with sleek accents to create something elegant but not intimidating. 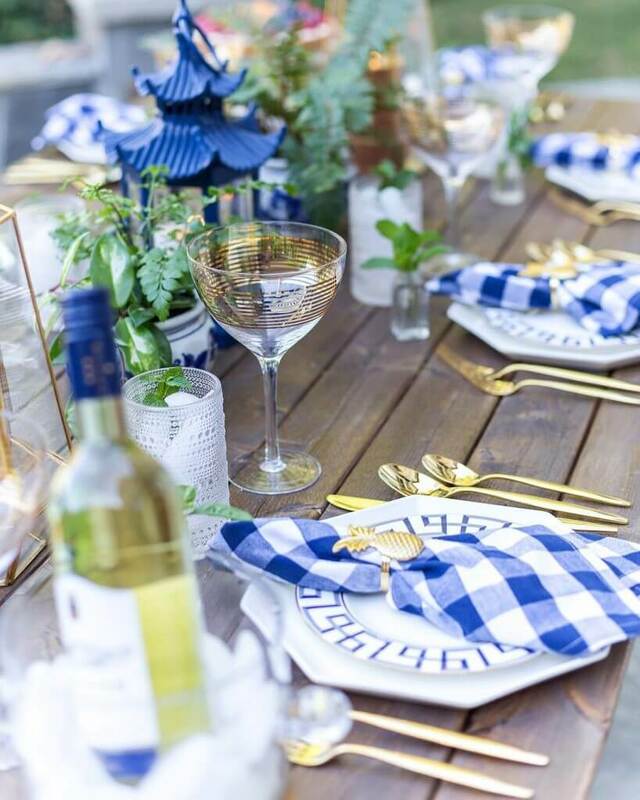 Checkered napkins with gold rings in cute designs, matching gold cutlery, textured glasses, printed plates, and stylish lanterns – now that’s how a relaxing tablescape looks like. You know you’re going to have a wonderful time when you see a some nicely done plating and gorgeous florals on your table. 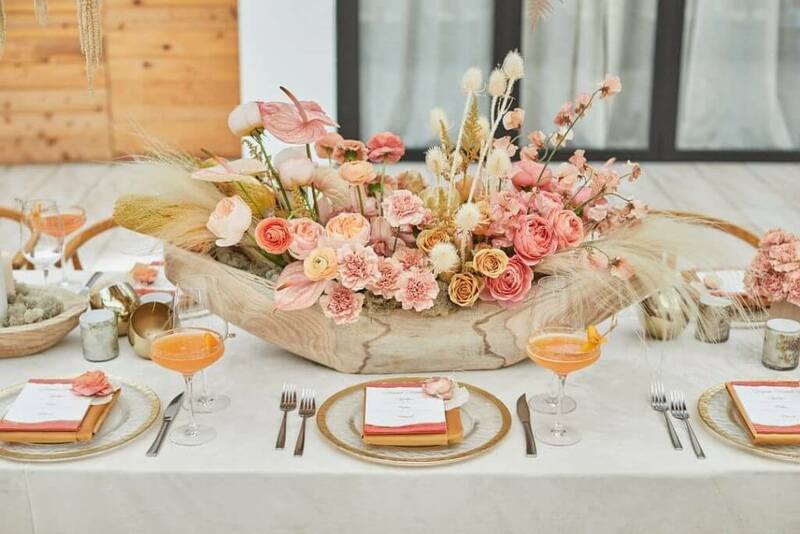 This neutral setting looks like a bohemian dream – gold-rimmed plates, flawless glasses, copper candles, and a stunning centerpiece of various blooms, wildflowers, and pampas grass. Whatever the time of the year is, there’s always a table setting to complete the match the surroundings. Winter, spring, summer, fall, there are always tablescapes that fit the season. Cool colors and refreshing designs are what you just need to beat the summer heat. 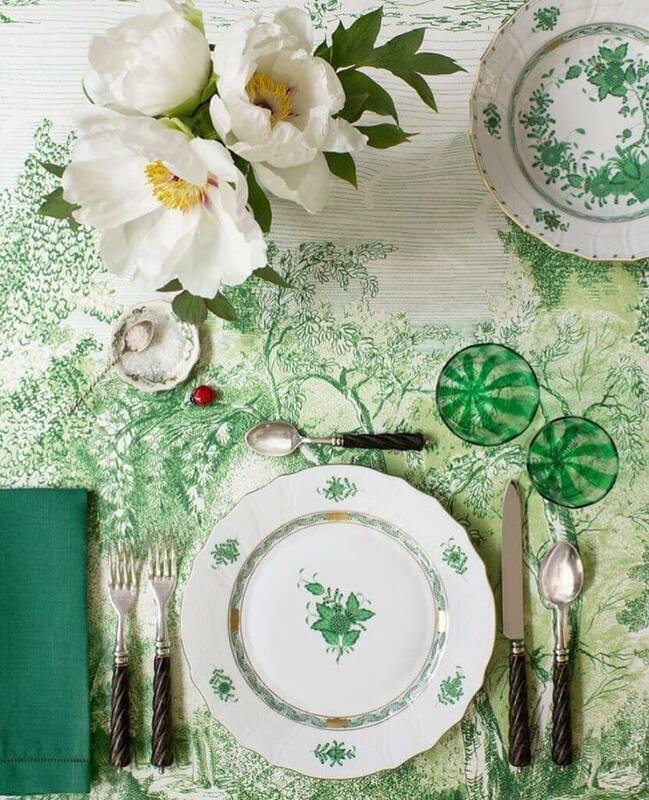 Lovely, light, and lively, the patterned linen, colored stemware, plates, and napkins in complementing hues of green and white take us instantly transport us to the most enjoyable time of the year. Nothing more inspiring than spring! Flowers are in full bloom, the weather’s nice and crisp, and the surroundings are beautiful like a dream. 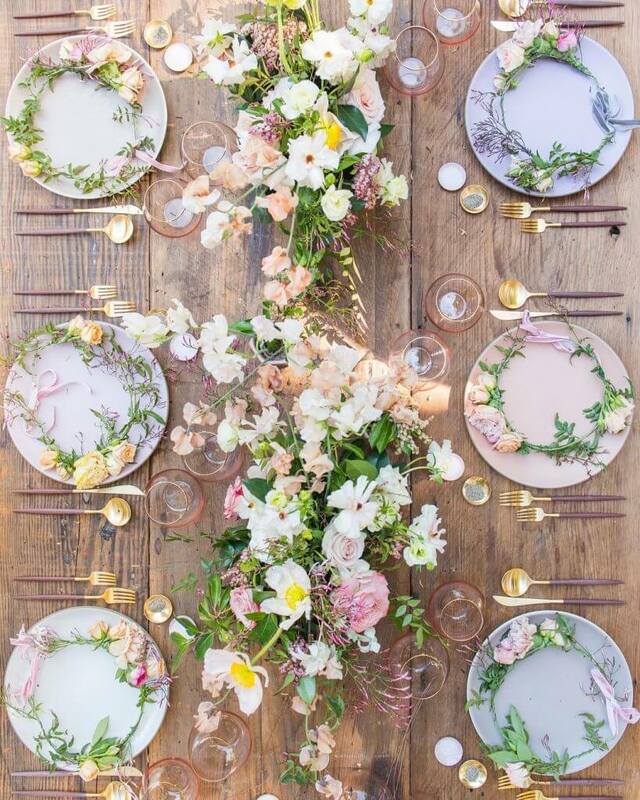 And the best way to celebrate is to have a floral-inspired tablescape. 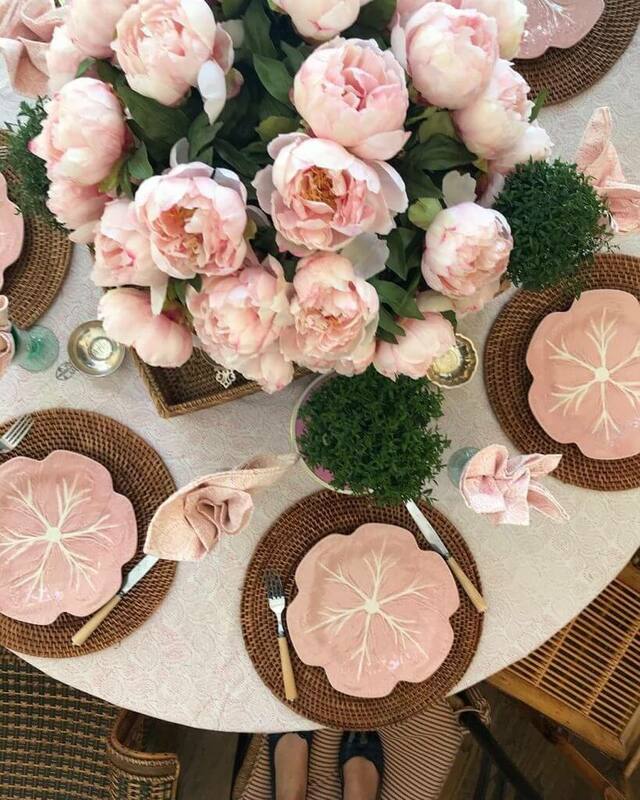 Flower-shaped plates, woven chargers, patterned linen and napkins, and some pretty and plump florals are the only elements you need for the perfect spring table. 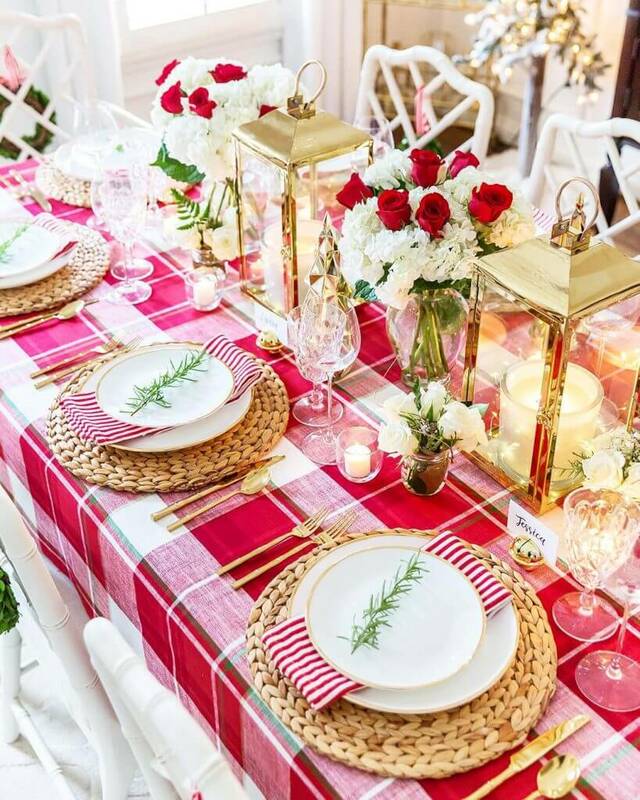 Cool, chic, and cohesive, this holiday tablescape is what Christmas dreams are made of. 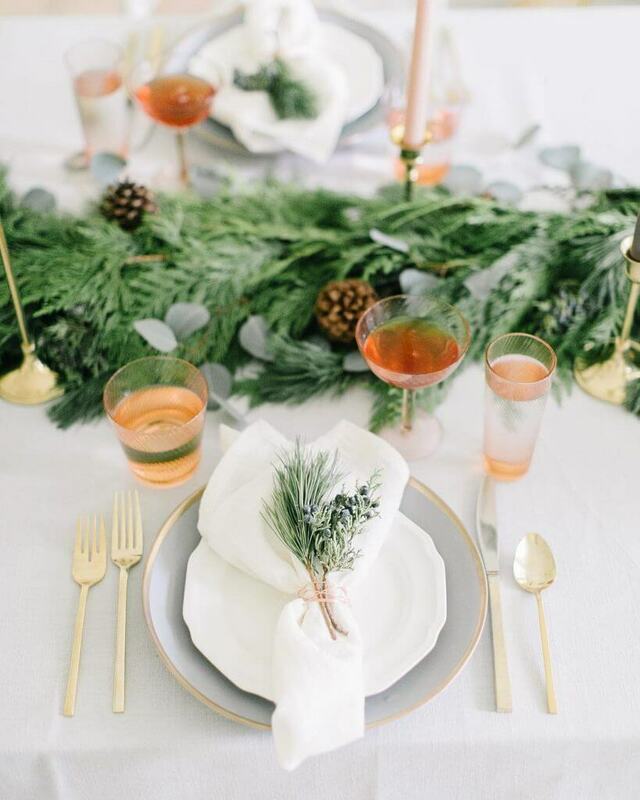 Stemware in warm tones, golden cutlery, sleek plain plate in matching charger, white napkin tied with a sprig of greens, and a running centerpiece of pinecones and greens – enough to give you a warm fuzzy feeling inside. Warm tones and wonderful hues, there’s something truly comforting about fall. Be it a grand indoor gathering or a quiet dinner at the backyard, autumn-inspired tablescapes exude a cozy ambiance that make every weal an enjoyable one. 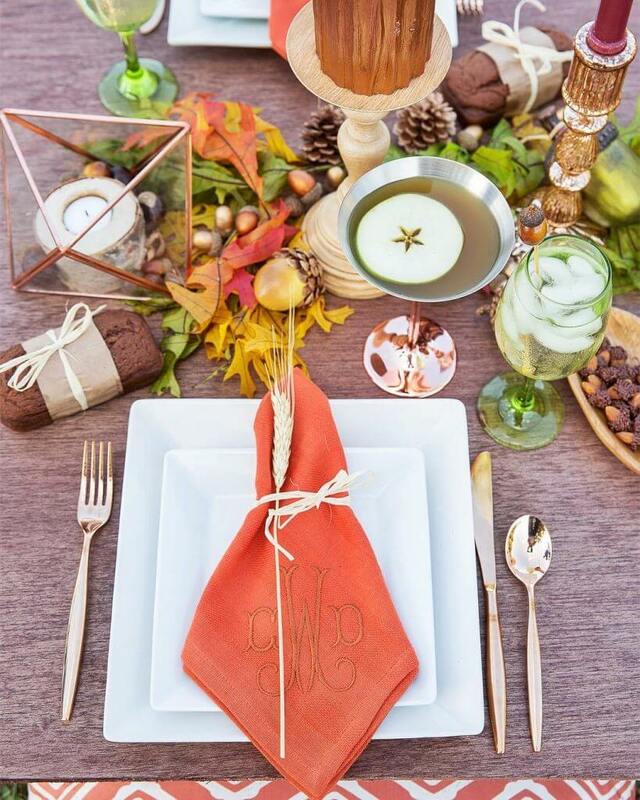 Monogrammed napkin and golden cutlery, scented candles, leaves and acorn accents, plus caramel martini and pumpkin treats for refreshment – oh this is the dream! It’s the most wonderful time of the year — to create the most stunning tablescapes, that is! Fairy lights, charming crystal wares, golden tableware and lots of reds and greens – nothing’s more Christmas-y than this. Add some texture with woven chargers and bold lanterns for a merry masterpiece. Make your Tuscan dreams come true with this sunny and stylish outdoor tablescape. Browns, whites, and golds are a triple treat when it comes to design add in some fruity accents and you’re set. Casual gatherings instantly elevated to chic celebrations.